The installation for In Which _______ and Others Discover the End utilizes repeated abstract forms to create a layered and seductive environment. Themes present in the work include the connection between mind and body, the complexity of contemporary life, and the indiscernible boundary between fact and fiction. The installation serves as a “set” of sorts for a series of live performances and events, while also inviting the viewer to step into the set and inhabit it during gallery hours. In this way, the line between audience and performer is blurred as the audience enters the stage and explores the work from the inside, moving through it and becoming enveloped by it. received her BFA from the Rhode Island Design and her MFA from the University of Minnesota. 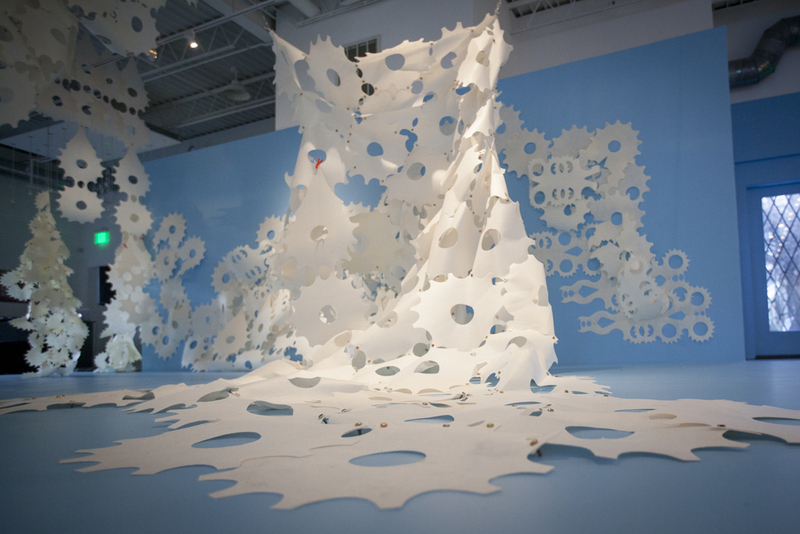 Miller’s large-scale, mixed-media installations and works on paper have been featured in solo and group exhibitions regionally, nationally and internationally. Miller’s awards include a 2013 McKnight Professional Development Grant from Forecast Public Art; a 2011-12 McKnight Foundation Fellowship for Visual Artists; a 2011 Joan Mitchell Foundation Painters & Sculptors Grant; a 2007-08 MCAD/Jerome Foundation Fellowship; and Artist Initiative Grants from the Minnesota State Arts Board in 2007, 2009, 2012, and 2014. Miller lives and works in Good Thunder, MN. She is Professor of Installation and Drawing at Minnesota State University-Mankato. To view more images of the exhibit and opening reception, click here. All photos above and throughout the site by Joe and Jen Photography.